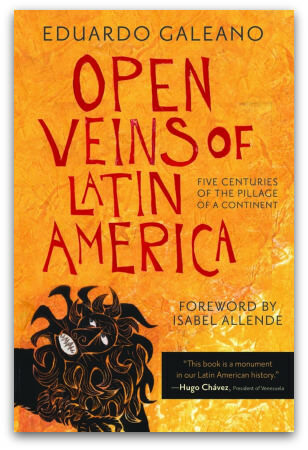 Lately I've been reading Eduardo Galeano's book, Open Veins Of Latin America. The early portion of the book discusses what happened to Spain in the 16th century following its conquest of Latin America. The Spanish created mines and drained the area of its gold and silver, so receiving a huge infusion of unearned money. One might suspect that this windfall turned Spain into an economic powerhouse. But some funny things happened when the easy money arrived. The Spanish king proceeded to spend a huge amount of the nation's reserves on wars against the 'enemies of Christianity'. The nobility and upper-classes poured vast sums into new estates, palatial homes, and luxury goods imported from other countries. Many in the lower classes, attempting to emulate the gilded, ostentatious lifestyle of those above them, abandoned productive jobs and rushed into speculative pursuits. Little of the new money was invested in domestic industries, and tariffs were dropped to meet consumer demand. In the end the new money flowed out of Spain, the local industries crumbled, and the nation ended up bankrupt. Sound familiar? Replace the words 'gold' and 'silver' with 'credit' and 'leverage' and you have a pretty accurate description of the United States over the last decade. And, to a lesser extent, of other 'advanced' nations like England. The parallel experiences of 16th century Spain and of the United States and England 500 years later suggest that it is perilous for a nation to put the interests of finance and speculation over real investment and production. In a global economy, the peril extends to the other nations it conducts business with, which is pretty well the whole world. The parallel also suggests there's a big difference between creating wealth (as real industries do) and making money (as stock market players and bubble speculators do). You can make a ton of money and not create any wealth. Making $100,000 flipping a house or trading stocks creates the same amount of real wealth for a country — zero. So what could nations do to get real investment in real industries flowing again? An enticing idea, floating around for some time, has not received the attention it deserves. The idea is simple and straightforward: it would place a small transaction tax of one penny on every stock market trade and use the proceeds to invest in real industries that create real wealth. In this way you tap speculation (money making) and use it to create real, long-term wealth. At a very small cost to speculators nations could give themselves the means to launch real programs for building the industries of tomorrow that they desperately need. It could also re-fund essential public programs, like public health centers that must deal with the threat of swine flu during a time of budget cut-backs. Getting that penny out of the speculators will be a fight. But if the American tea-partiers are any indication, working people won't be ponying up investment money anytime soon. And they shouldn't have to. They've been surrendering their pennies for long enough while they work at (and are fired by) companies that create real wealth. This sounds like Pauline Hanson's transaction tax again! Surely there is a parallel for us with Spain's misuse of the proceeds of its mining in Latin America. Just substitute coal, iron ore, natural gas, and bauxite for gold and silver. I did not realise that Thomas Sullivan is not Australian when I read his article. When he writes "... Sound familiar? Replace the words 'gold' and 'silver' with ..." I expect him to name Australia. It turns out that he refers to those other great Anglophone Fantasylands, UK and US. Neo-liberal economic theorists love citing Adam Smith's "Wealth of Nations", which is all very well except that none of them have considered the transitory nature of all industry, that the only certainty is change, that the only hope for material human progress is technological development. That's before we even look at spiritual progress. Australian states subsidise the ripping down of our greatest assets that have taken millenia to construct, and feeding them through giant machines for export, for other people to turn into ... pulp? This is justified as "supporting jobs", but when ten workers (who are paid pittances anyway) are replaced by an even larger tree-destroying machine, that's free-market progress. No-one wins. In the long term, even the workers in those far-off pulp factories don't even have nice forests to visit in their holidays. "May you live in interesting times" is a nuanced greeting. It could be added that living in a bounteous land, a "Lucky Country" allows an ill-considered complacency. Gareth Evans suggested way back that .01% tax on currency and futures trade would finance peace-keeping force and disaster relief. The slaughter of hundreds of the natives who wouldn't convert to Christianity in Latin America probably wasn't told to the Spanish people. One element of Spain's problem was that by mining so much gold and silver, they reduced the value of those precious metals used in Europe for currency. The result was rising prices in terms of that currency. Apart from that, what productive things can you do with gold and silver in a 16th century economy? Niall Ferguson (author of "The Ascent of Money" on the ABC at present) called this problem a resources curse. Australia suffers a resources curse, too, but in a different sense. In so far as profits from mining, etc. flow out of Australia or away from productive enterprises without also encouraging productive local investment, it is our loss. Furthermore, the financial crisis has provided mining companies the window of opportunity to eliminate people almost completely by automating mining to a greater and greater extent. History won't see Australia like Spain, but like Peru. Yes, Tom Jones and David Arthur, the words 'iron ore' 'coal' 'uranium, 'trees' quickly come to mind. I often think that the world will end when there are more humans in the world than there are trees, the world will come to an end. We are accelerating the arrival of that day. Harry, Perhaps it is important that the story be told by the Spanish people too. I believe that Australia has promised to donate .7 of 1% of its Gross National Income to overseas aid. I did not see any mention of that in the latest Budjet. Have I missde something? It is worth remembering that ‘industry support’ is just protectionism by another name and means. It may work to keep Australian’s, or American’s, employed in the short term. It removes, however, any effective market for many of the products of Asia, Latin America and Africa. Africa in particular continues to suffer, not so much from a lack of aid, but from European tariffs and internal industry support which makes African products uncompetitive, thereby denying millions the chance to scratch even a miserly living. If we wish to offer support to our neighbors we must give them equal access to trade their products in our market. Arbitrary measures which restrict the trade of agricultural and industrial products only serve to perpetuate poverty in developing nations. This was very helpfull for my report. I learned more here than on wickopedia. I am in a play and we had to research are parts. I am a military leader, and the economic info helped a lot).